Geraldo Fontes. All photos by Nic Paget-Clarke. 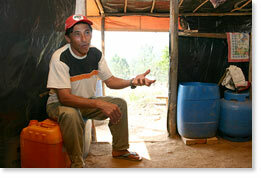 Sebastião Vieira, a regional co-coordinator, in his family's home in the joint MST (Landless Rural Workers' Movement) camps, Dom Pedro Casussaudale and Camilo Torres near São Paulo, Brazil. He has been in the movement for 16 years and has been in this encampment for one year and five months. Maria Vieira, co-coordinator of ten families at the joint MST camps, Dom Pedro Casussaudale and Camilo Torres. 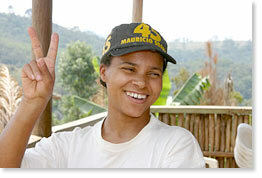 Daughter of Maria and Sebastião Vieira. 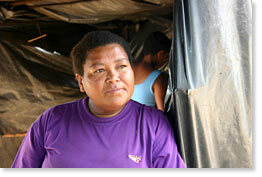 A single mother who has lived in the two camps with her children for five months. 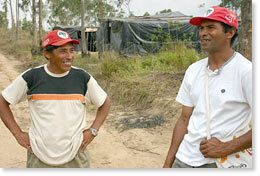 Sebastião Vieira with João Baptista Amorim, member of the MST regional directorate of greater São Paolo. Ana Amorim talks with Sebastião Vieira. 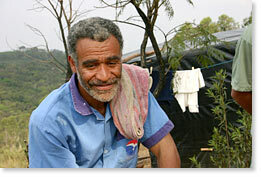 Geraldo Fontes is a member of the national collective for the coordination of foreign relations for the MST (Movimento dos Trabalhadores Rurais Sem Terra - Landless Rural Workers' Movement). He is responsible for maintaining international political relations. This interview was conducted and later edited by Nic Paget-Clarke for In Motion Magazine, with simultaneous translation by Ana Amorim, on September 2, 2004 in São Paulo, Brazil. The interview is in two parts. Part 1 -- Building the New Society Now. Part 2  Agrarian Reform / Agribusiness. In Motion Magazine: How and why was the MST founded? Geraldo Fontes: The MST is a product of a series of struggles, which were reactivated in Brazil in the ’70s, after the implementation of what was called in Brazil the Green Revolution. At the end of the ’50s and during the ’60s, there was a growing process of exclusion of peasant families, (and) those peasant families migrated to the cities hoping to get there the living conditions, such as housing, education, health that would allow them to survive in the city. During that time in Brazil, it was called the economic miracle. There were very large state investments, which allowed people to have the feeling that this miracle was actually possible, that people achieving living standards would be possible. To finance this economic miracle, the military government at the time was forced to increase debt with foreign governments, economic institutions, corporations, which increased tremendously our foreign debt and our foreign dependency. At the end of the ’70s, with the world economic crisis -- due to several measures the U.S. had adopted in the ’60s and ’70s such as the dollar becoming the official currency of the world -- the loans to developing countries were interrupted and interest rates were raised in order to finance this world crisis, the economic crisis, the U.S. was going through. 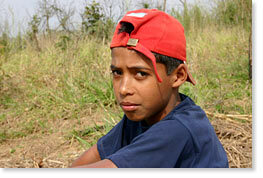 In Brazil, this potential for a dignified life for peasants in the cities was interrupted by this crisis. The families who left the countryside with the Green Revolution, the families who left the country to go to the city hoping for this miracle, for them the miracle was interrupted. These families saw no alternative in the city and they decided to return to the countryside -- to go back and work the land again. But, when they arrived back in the countryside, because of the Green Revolution they did not find a piece of land available for them to work. Why could they not find a piece of land to work for their own survival? The agricultural model implemented in the Green Revolution, which the neo-liberal policies made even more clear, did not allow that. This agricultural model is characterized by several elements. First, it has to be developed in large extensions of land which we call latifundio. Two, it is monoculture. You have large extensions of land with just soy, or cotton, or cattle, or orange, or coffee -- large extensions of land with just one single culture. Three, the mechanization of agriculture is using more and more tractors, harvesting machines, and very little human labor. 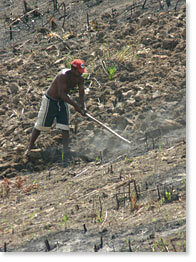 Four, the productive process uses large amounts of chemical products, such as fertilizers and pesticides. And fifth, this whole agricultural model is designed for export. In this situation, when the families returned to the countryside after the failed economic miracle, they found a completely different situation from the type of agriculture their parents had lived in, which was the family agricultural model. The family agricultural model is completely the opposite of the Green Revolution. 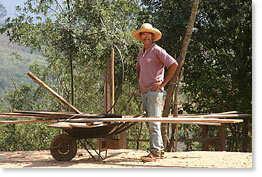 For example, number one, the family agriculture works in small properties as opposed to large latifundios. Second, it works on diversity. They plant several different products for personal consumption and for distribution in local markets as opposed to the monoculture of the Green Revolution. Three, the whole family works the land and they use very few machines. They use much more human labor. Four, they work much more organic production, which causes a much smaller impact in the environment. And fifth, the family produces for their own consumption and for the local markets, which is completely the opposite of the Green Revolution, which works for export. Think about this situation. 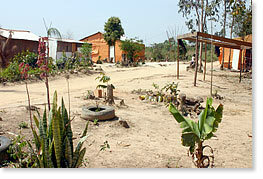 At the end of the 70s, when the families returned to the countryside and found this new reality and they are aware of the fact that there is no alternative in the city, the only solution they find is to get together several families, organize, and occupy land, (part of) large extensions of land. In the beginning, these radical actions from groups of families were isolated. 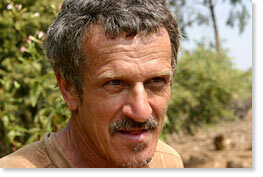 You have something that would happen in Rio Grande do Sul -- a group of families would occupy land. Another group of families would occupy land in the center of the country. They were isolated. They were not coordinated. Therefore, because they were isolated, it was much easier for the state and for the large landowners, the latifundarios to repress those actions and take control back of the properties. As a solution for that, and supported by the Catholic and the Lutheran church organizations, the families found a place in these churches to organize and talk about the situation and look for strategies to fight back against this control. That aim, that strengthened their movement, gave a national dimension to the movement as opposed to dealing with these problems as localized and individualized problems of twenty families in the south, or 30 families in the west. They had the opportunity to meet and be supported by these church organizations. They could discuss and look at this movement as a project, a national level project. So, what we have talked about so far is the economic aspect of the origins of the movement. But also around this time there was a re-birth of the social movement of the whole society that starts realizing that people have rights, which had been forgotten during the military dictatorship (1964-1984), or were not dealt with. Between 78 and 84 the church, mainly the Catholic Church, but also the Lutheran Church, the Methodist Church, not the Pentecostal Church, they started organizing a grassroots movement of the whole society. The trade union opposition, which had been completely eliminated during the military government -- some trade unions actually sided with the military government, which wasnt good -- they started to organize and create an opposition movement to the policies and the current situation. Also, you have the Black movement starting. And opposition political parties started being recognized at that time. The PT (Partido dos Trabalhadores -- Workers Party) was formed. The struggles for housing rights started at the time. And the MST. All that between 78 and 84. The roots of all these movements. There is an intense movement of excitement, a positive moment where opposition and movement for change starts being organized. So, between 1981 and 1984, those families who had returned to the countryside and had found a new economic model, combined with the support from the church, the re-birth of trade unions, and the possibility for social organization. This created the fertile conditions for the founding of the MST. In January 84, we had the first national meeting in Cascavel in the south and the MST configures with its very characteristic aspects, which are present now. Those characteristics are: its a mass movement; and its an autonomous movement with no links to church, trade unions, or political parties. Also, it has three main objectives: we want land; we want to achieve agrarian reform; and we want the transformation of society. In Motion Magazine: At what point did you start developing your institutions and services? Geraldo Fontes: The MST is a social movement that has different characteristics to an NGO (non-governmental organization) or a trade union. The services provided by the MST in the communities that have been organized by the movement have completely different characteristics. For that, I will try and explain how we work. We have three big elements in our organization. First, the grassroots cell. In some places they call it a family cell. This grassroots cell is structured the following way. Each group of ten families is a grassroots group. In this nucleus of ten, sometimes twelve, sometimes nine families, the objective is to discuss problems and look for alternatives. The problems range from the day-to-day problems to issues such as FTAA (Free Trade Area of the Americas), the policies of the Lula government, campaigns against the World Trade Organization (WTO). From their day-to-day lives to the political actions at state, national, and international level. And each group of ten families has a coordinator man and coordinator women. What you have to understand is, it is not the MST that provides the service to the families, rather what you have is the families, organized, discussing the issues that affect them to seek alternatives. Another element that is important in the movement, is what we call instances, which are organizational levels. But those organizational levels are not hierarchical. They are levels in terms of organization in order that we can create operations that will actually be performed. In terms of the levels, we have several. The most immediate level, working directly with the families, this level is called brigade. This is a very difficult word in English, because it has several connotations, especially in Europe where it has a very bad image. But all it means is it is a level of organization. The sequence is, you have groups of ten families, each five groups of ten families, which means fifty families, has two coordinators, a man and a woman, and when you get ten groups of fifty families you will have 500 families, and those 500 families are brigades. And they have coordinators, a man and a woman. At the next level, we have the state coordinations. But there is not a norm that forces all states to organize in the same way. In some states, the coordinator of the state is the same as the coordinator of the brigade. In other states we may have two groups; they have the coordinator of the brigade and the coordinator of fifty families. In some of the states, instead of the brigade being 500 families, sometimes it is 200. The important thing to understand is that the grassroots organization is the most important thing for the movement. The families must be organized and have an effective representation throughout the movement. And the next level from the state coordination is the national coordination, which is comprised of three representatives per state, plus two representatives from different sectors which are work areas, areas that we organize to discuss particular specific work issues. We have the education sector, health, culture, communication, production, so on and so forth. It depends on the needs of each camp. In Motion Magazine: Can you talk about education in the MST? Geraldo Fontes: The education sector works in four different areas. First, literacy programs for young people and adults, people that have gone beyond the school age but cant read and write. In Motion Magazine: Is that exclusively in the settlements. Or do you go out into the broader community? 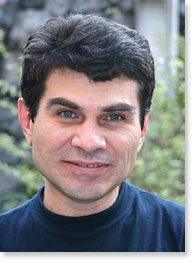 Geraldo Fontes: It depends on the reality. We are not very strict. As a landless movement, we are trying to relate to other peasant organizations, in order to broaden our movement, to strengthen our movement. We do offer to others. For example, small farmers that live nearby a settlement, they can participate in these literacy programs that we have. The second area we call the kindergarten area. It is pre-schooling education. 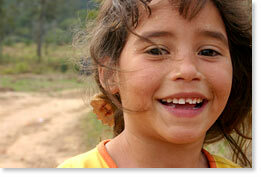 The program comprises children from the age of one to five. We try to encourage a socialization process among children, talking about their reality in the country, developing playful activities, creative activities, but very much related to their reality. The third area is the schooling, per se. It depends on the area. It goes sometimes from first grade to 8th grade. Sometimes it goes from first grade to university level. And now in some areas even post-graduate level. The fourth area is the professional training. It is teaching training, within the guidelines the movement has adopted, which has to do with the teaching of Paolo Friere, The Pedagogy of the Oppressed. The teacher training uses his ideas, in terms of methodology, to apply in all schools around the country. In traditional, conservative universities they dont study that. When a teacher finishes his degree, his regular degree at the university, he has to come and study with us to learn our method in order to be able to work with children and teenagers. Those are the four areas of the education sector but also there are other various sectors according to the reality of the camps and settlements. Each sector will have different areas. For example, like the education sector we have just described, the health sector will have various areas as well. In the health sector, we have an area that works with herbal medicine. They develop traditional uses of herbs. 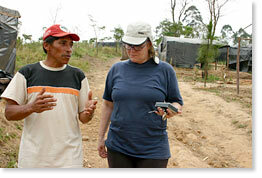 We have what we call health agents, who work with people in their immediate needs. And we have some students going to medical school who will come back to the movement and work here. There are many sectors. Trying to finally answer your question, all these levels, the grassroots level, the levels like the brigades, the state coordinators, the national coordinations, the different sectors  health, education, communication, they all combine because they work altogether. They are what we call the MST. What you would say, the services. The MST is not an organization that provides services to families. The MST is an organization that through the families, the families provide the services to themselves. The movement is a facilitator of those services. It mediates them. The needs and the offer. Again, for example, we have a sector that is called Production, Cooperation, and the Environment. This sector works with the families and in order to start production they have to work with the government demanding credit lines. Those credit lines are for the families to produce. The families individually do not go and negotiate with the government. It is a larger broader thing, which is called MST, which as a whole goes and negotiates with the government to get the best deal for the families. When I say that the MST goes and negotiates with the government, I am not talking about an individual, a personality, a specific person. When I say the MST negotiates, I mean the families. For example, organizing large marches in the name of the MST to demand better quality of credit, or whatever they need. It is not like they have a body or organization that does that negotiation for them. They do it themselves, through the name of the movement with the support of the structure of the movement. A home under construction at the Dom Tomas Balduino settlement. The document making this a settlement was signed just a week before this photo was taken -- after three years of temporary status as an encampment. There are 408 families in the settlement. 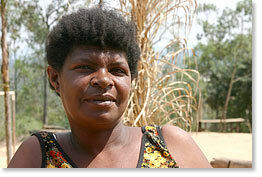 Community member at the Dom Tomas Balduino settlement. The home of Luis Carlos da Silva and his wife. 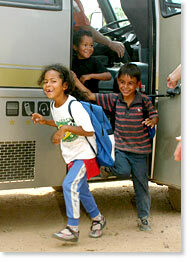 Children arrive back at the settlement from school. In Motion Magazine: Could you go into more what you mean by production? Geraldo Fontes: The production sector, which has a big name -- Production, Cooperation and the Environment -- is a sector that has a very big responsibility in the movement. When I say that the production sector is very important to the movement, it doesnt mean that it stands out as more important than other sectors, all sectors are extremely important, education, health, they are of equal importance. But it is a sector of enormous responsibility. When I mentioned earlier that in 1984, in the founding of the movement, there were three objectives, land, agrarian reform, the third objective was the transformation of society. It means that we have to build a new society. To build a new society it has to be done by ourselves, alone, We cannot depend on the government, an institution, or a party. It has to be done by ourselves. 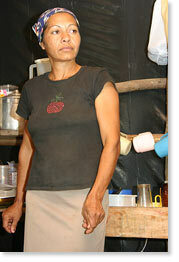 That has placed before us a new challenge, not only us but others like the Zapatistas and other social movements. It has offered us a new challenge, which means to build a new society without depending on power or having to take power. In the 70s, or even before, up to the 70s, when social movements or political parties wanted to take power, when they wanted to change society, they believed they had to take power. They had to take the state, either through a revolution, armed revolution, or through elections. They had to take the power, the state and from the state make the necessary changes to transform society. The new challenge now is to make changes without taking the power. Make the changes from now. As they happen. The structure of the new society. What we want is a transformation of society. How to do we do it? By living this new society now. Doing step-by-step changes. This construction of a new society from our own communities forces us to plan the life that is going to happen in these communities. One element for this construction of a new society, as I mentioned before, is the fact that our grassroots level, the groups of ten families, together discuss their everyday issues, from their everyday issues to national issues, international issues, in a very active way, because they are small groups. That for us is the beginning of the construction of the new society. The production sector then, has to organize the families, has to organize plans working along with the families, to solve their immediate needs. This sector is responsible for the follow up of all aspects of production. That implies helping families to get credit, assisting families with technical assistance, also assisting families in terms of trade, markets, and agro-industries -- small industries of agricultural products. But it is not only on assisting families with these elements, credit, technical assistance, trade, that the production sector focuses, it also focuses on creating conditions for these families to work in a new way. For instance, in the society we live now, individualism is heavily encouraged, selfishness -- we focus on solidarity. If capitalism encourages competition to get what you want first, we encourage cooperation. This new society we want to have has to be based on new values. The responsibility of the production sector through the participation of the families in the decision-making, through associations, co-ops, is to encourage, to promote these new values we want to live, to have in the new society. In such a way, with these new relations of the productive aspect of the community, with the construction of new values in the society, we create a permanent situation of building this new society. Construction in motion. An idea in motion. It is not a permanent fixed thing. It grows. What I want to say is the work that is done in the movement, the MST, is a movement towards this permanent new society. Now, it is not a linear movement, that we are going to go from A to B in a straight line. (Draws a spiral). In fact, you dont have a straight line going from A to B. You are having a constant spiral movement going in progressive circles towards this ideal new society, which is built through the different obstacles and new experiences that are appearing in front of the movement. Giving a concrete example, education for us is not just to have a building, the desks, the chairs, the books, 50 children, and a teacher. For us, education is a whole way of looking at the world, of constructing the world; towards the values we aim at, which are participation, solidarity, cooperation. It would be very easy for us to say that in this permanent new society we would have to have one school in each settlement. We would have in each settlement a building, the desks, the chairs, with the children and the teacher and we would take a picture. We could show to the world we have a school in each settlement. But that wouldnt necessarily constitute a new society, because for us what is most important is not that you just have the material aspects but the new values. When I talk about this distinction between transient and permanent, transient is, as I said, to build a school. Or to be able to get credit to buy tractors. But the most important thing in terms of the tractor is once you get it, what we are going to do with it. How we are going to manage that tractor. More than the actual machine itself is how we are going to work with that machine, in what ways. In such a way that the use of that tractor will reflect the values that we want to implement in the new society. The society we want is not the welfare state, because those are material issues. If we take the example of Sweden, which is one of the countries with the highest life index, they all have access to school. They have access to all their material needs. But it is a country with a very high incidence of suicides, alcoholism. This is what I am trying to say in terms of this new society. This new society is not restricted to material achievement. What we are talking about is a transformation of the whole way of looking at the world, which is constantly in motion, changing. I apologize if I am being too abstract. The important thing is to understand we want to build a new society and we have to go through the stages. It might not be the easier, quicker route but it is the necessary route. It involves its contradictions, its constructing process. You have to look at the process you are going through and criticize and change, learn from your mistakes and experiences. It is not a direct route. We can state it clearly now that we in the MST do not have any settlement in the whole country that has managed to reach this state of permanence that we are talking about. Some of the settlements have advanced more in some productive aspects, have developed some agro-industries. 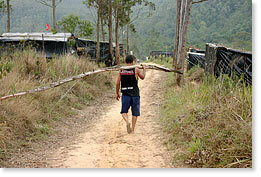 Some settlements have very advanced human relations but the production sector might not be that advanced. 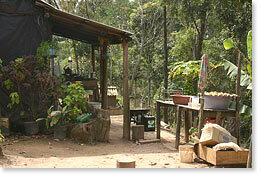 For example, a settlement in Bahia and a settlement in Rio Grande do Sul -- both settlements are six years old. You will not find that both settlements went through the same stages. For example, first they built the houses, then they built a school, then they got a tractor. Each settlement will have had different developments. Each reality will conduct the process in a different way. But throughout the country, in any settlement in the country, the goal is pretty much the same: to build this new society, to move towards this new society. In Motion Magazine: How many settlements are there? Geraldo Fontes: In the movement what we have are 270,000 families in settlements and 114,000 families in camps. You would estimate an average of six people per family. I dont have the exact number of settlements at the moment but it is around 5,000 to 6,000 settlements in the country. In Motion Magazine: From being a part of the World Social Forum, do you see that there is a trend in the world of autonomous-type movements? Geraldo Fontes: Three years ago a group from Catalonia visited the movement. They were here for some time and on the last day we had a discussion and they actually told us that we were anarchists. Why? Because we are building communities that are autonomous. They have their own financial structure, their own internal structure, production structure. They are completely autonomous without depending on this thing called the state. In Latin America, anarchism is viewed as a very negative thing. It is considered chaotic in the sense of nothing constructive or good will come out of an anarchist situation. This is very strong here. So when the people from Catalonia told me that, I was really scared. I said no way. Later on, I decided to study about anarchism and I realized that anarchism has to do with becoming independent from the state and not to do with chaos. We from the MST, from within the World Social Forum and the anti-globalization struggles --towards this construction of the new world -- we do not dismiss the role the state could have. Not a state as we know it now, responding and fulfilling the interests and needs of a particular class, but understanding the state as a situation that would facilitate the consolidation of these new structures for this new life, this concept of living. Of course, within this process of the World Social Forum and its groups there are groups that are totally against the state. Through the structure of the settlements, we pressure the government and we fight this model of the large landholdings, the latifundios, the monoculture, the mechanization of production, the intensive use of chemical products, and the agriculture directed towards export. We pressure the government to actually go back to a more family agriculture. When we talk about agricultural policies, the definition of agricultural policies is to decide subsidized credit, the distribution of production, and they cannot be defined within settlement situations. That is the role of the state. It is not just the role of the federal government. In terms of the implementation of laws, it does not depend on the federal government alone to establish those laws. It also depends on the judiciary, on the media, on legal power. If you unite all these different powers it is what you can consider the state. So, in a settlement, for example, we pressure the federal government and the federal government is just an element of the state. In order for the federal government to make it feasible, this credit line, the government will have to relate to all the levels of the government. We understand that the state as a whole is essential for the functioning of the society and in that way we are not anarchists because we are not against the state. In order to transform the state that now follows interests that are totally against our interests, we have to build from the grassroots. For instance, in terms of the media, in this country the strongest media companies are controlled by seven or eight families. We, in our settlements and camps, we have to construct alternative ways of communication where families will be able to communicate the issues that relate to their lives. We have to build our own financing schemes. We have to build financing co-ops, consumer co-ops. 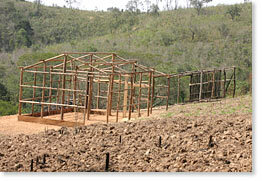 From here changing the structure of the grassroots, from the different settlements and camps. By changing the structure of these small communities, we are indirectly changing the structure of the state. We are not anarchists because we dont say we dont want any state. We want to create change in the state and we are doing that through the change, the interaction between the community, the grassroots organization, and its relation to the state. We agree with many people that say that the MST is similar to the Zapatista movement in some aspects. They construct their juntas in the sense that they dont have to submit to the state that is already in the area. Instead of depending on this state that is there, they create all the structures within their own communities. They might need some outside resources but they will be directed, they will be specific, they will not be broad. Let us say that the mayor of a town decides that he is going to build a road or bridge through a settlement. If the community decides that the bridge or the road is not priority they will not accept it and they will fight for something they consider priority, which might be water facilities. It might be sanitation. It might be sewage. It might be other things that the settlement needs as priority. They will determine what the priority is and they will pressure the government to obtain it. This is a very localized example but we have to understand that there is a broad dimension to the state and our relationship of our communities with the state that allows us to progressively build this new society. Many of the movements in the World Social Forum have this tendency. So, yes, there is a tendency towards autonomy but not towards a rejection of the state.